Infinitely inspiring, the RC-505 Loop Station has become an essential performance instrument for beatboxers, singers, and club performers around the world. Filled with new features requested by top users, the Version 2.0 update brings even more creative power to the flagship tabletop looper. Simultaneous effects can now be used in the Input FX and Track FX sections, and a number of new effects types are included. Many refinements to the loop functionality offer a multitude of ways to enhance and improve live performances. The control target functions have been greatly expanded as well, providing a wealth of external control options for musicians who loop with guitars, keyboards, and other instruments. 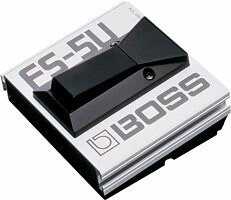 The RC-505 features five stereo phrase tracks that can play simultaneously, the most yet in a BOSS Loop Station. Independent record/overdub/play and stop buttons for each track let you capture and control loop performances with your fingertips, and dedicated volume faders allow you to mix loop levels on the fly. Each track can have its own playback mode (multi, single, one-shot, reverse, etc.) and tempo sync settings, providing an unlimited range of creative looping behaviors. With the RC-505’s large selection of built-in effects, it’s easy to enhance your sounds as you perform. Input FX allow you to process the sound during loop recording, while Track FX provide further processing options for phrase playback. Six dedicated on/off buttons—three each for Input FX and Track FX—can be loaded with your favorite effects, while grab-and-go knobs let you tweak parameters such as filter cutoff and effect depth in real time. With the Version 2.0 update, the assigned effects can now be used simultaneously, and newly added effects types offer even more processing options to choose from. Global compressor and reverb effects are also on hand, perfect for adding some finishing polish to the overall sound. 99 phrase memories provide onboard storage for phrase track data, various playback and effects settings, and more. A combination of frequently used settings can be saved as a User Set, which you can easily load to quickly reconfigure any phrase memory, even in the heat of performing. 85 different onboard rhythms offer backing for loop recording, with a large selection of odd-measure beats for advanced looping. The rhythm part can be routed to the rear-panel Phones jack only, giving you a dedicated click track for monitoring purposes. With the Version 2.0 update, it’s possible to route individual phrase tracks to the headphones as well. The RC-505 is outfitted with a number of simultaneous inputs, allowing you to capture and mix a variety of different audio sources as you build loops. There’s an XLR microphone jack with phantom power, mono/stereo ¼-inch inputs for guitars, synths, or other instruments, and a mini-jack for connecting a smartphone or other stereo device. Via USB, you can plug into your computer and import/export WAV audio phrases, great for loop archiving or loading up phrases with live backing tracks or sounds for sampler-style triggering. The RC-505 also functions as a USB audio/MIDI interface, making it easy integrate with music software for stage performing with a laptop, audio recording, MIDI sync, and more. The RC-505 lets you set up customized real-time controls, extending your command of looping and many other operations. With the Version 2.0 update, you can specify up to 16 different functions and access them in a variety of ways—with front-panel controls, an external expression pedal or footswitches, and/or various MIDI CC messages. Many newly added target functions are tailor-made for foot control, perfect for looping musicians who have their hands occupied with a guitar, keyboard, and other instrument. The 16 control assignments are stored with phrase memories, allowing you to create and recall custom setups for different songs and performing situations. ASIO is a trademark and software of Steinberg Media Technologies GmbH. A simple footswitch for switching effects on/off on guitar amps, etc. 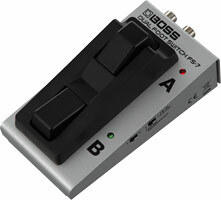 Two switches in one, BOSS’s FS-6 combines latch- and momentary-type switching into one unit. 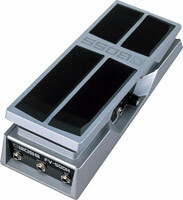 Compact, multifunctional dual footswitch for remote control of effect pedals or amp channel switching. 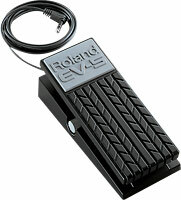 Durable expression pedal for use with keyboards or other Expression-compatible instruments to control a range of functions and effects parameters. 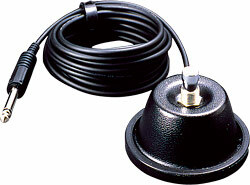 Tank-tough diecast volume pedals with high/low impedance option.